A journey back in time to discover the history and traditions of Catalonia. Santa María de Poblet is the largest Cistercian monastery in Europe, while the ducal town of Montblanc still retains a magical medieval atmosphere. With this itinerary we will discover the historical and artistic legacy of the Cistercian Order founded by the French abbot Bernard of Clairveaux. The austere spirit of this congregation led to the creation of a style during the transition period between Romanesque and Gothic. We will leave Tarragona by coach and head towards the interior through villages, mountains and the valley of the river Francolí. 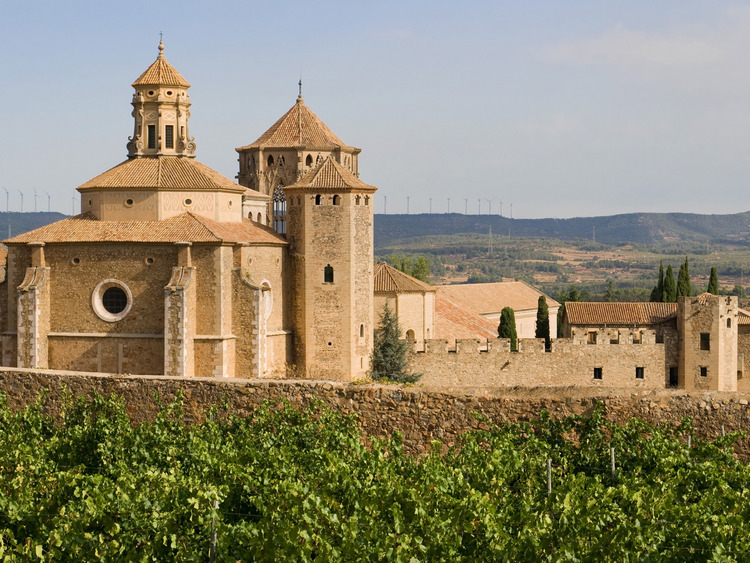 We will arrive at Espluga de Francolí where we will visit the Monastery of Santa María de Poblet, declared a UNESCO World Heritage Site. Surrounded by a beautiful wood, it is the largest inhabited Cistercian monastery in Europe. It was founded in 1151 thanks to a generous donation from the Count of Barcelona Ramón Berenguer IV and played an important role in the life of the village, contributing towards its numerous estates, its recolonisation and the cultivation of the lands recently reconquered from the Muslims. It features a church (with various royal tombs) and a primitive cloister (12th-14th century), surrounded by various rooms and buildings from various eras up to the 18th century including the Abbot's Palace, the chapels of Sant Jordi and Santa Caterina, the Royal Palace, the ancient cloister of Sant Esteve and the new sacristy. The monastery enjoyed the special protection of the Catalan kings until the early 19th century when the monks were forced to leave due to the laws of ecclesiastical condemnation. The monastery then fell into a state of abandonment until 1940 when it was reopened for worship and underwent a restoration project to return it to its former splendour. At the end of this enjoyable monastery visit we will get back on the coach and head for the enchanting medieval village of Montblanc. The village with its impressive walls, 1.7 km long and one of the best-preserved examples in Catalonia, maintains the medieval atmosphere of a place that was once the residence of kings and knights. Montblanc was at the height of its splendour during the reign of James the Conqueror. From the church of Sant Francesc outside the walls, we will arrive at Saint George's Gate where, according to legend, Saint George, the patron saint of Catalonia, killed the dragon. Within the walls the guide will introduce us to the Romanesque church of Sant Miquel, the Royal Palace, Plaça Major and the church of Santa María la Mayor in Gothic style with a Baroque façade (visit of the exterior). During the visit to Montblanc we will admire the lifestyle of the locals, the traditional shops and the relaxing, peaceful atmosphere of the streets of this extraordinary ducal village.